To study the genetics of coat color in dogs, researchers used a brush to get DNA from dogs' inner cheeks. Photo by Chris Kaelin. The gene produces a type of protein previously thought to play an important role in the immune system. However, the new findings suggest that these proteins, known as defensins, may be involved in regulating other important processes in the body, including pigmentation, energy balance, and production of glucocorticoid hormones. "This study has uncovered a new level of regulation in the body. We don't know yet, but it could have implications for understanding genetic factors involved in obesity, diabetes, and related diseases," said Glenn Millhauser, professor of chemistry and biochemistry at the University of California, Santa Cruz. Millhauser and three graduate students in his laboratory--Matthew Nix, Darren Thompson, and Bin Yu--are coauthors of the paper describing the new findings, published online November 2 in the journal Science. The study was led by a team of geneticists at Stanford University. The determination of coat color in dogs has long been a mystery. While most mammals share the same genetic mechanism to determine coat color, dogs seemed to be an exception. The Stanford researchers, led by geneticist Greg Barsh, identified a new gene in dogs that acts in addition to the two main coat-color genes recognized in other mammals. To their surprise, the new gene makes a beta-defensin protein belonging to the large and variable family of proteins called defensins, thought to play a role in fighting infections. To find out how the beta-defensin operates in the determination of coat color, the researchers needed purified samples of the active protein. But defensins are notoriously difficult to work with in the laboratory. So Barsh turned to Millhauser, a longtime collaborator, to produce a supply of properly structured beta-defensin for laboratory studies. The researchers found that the protein engages the melanocortin pathway, a circuit of molecular interactions that controls the type of melanin and amount of cortisol produced by the body. Barsh and Millhauser have been interested in this pathway because it determines not only skin and hair color, but also stress adaptation and weight regulation. "This gives us a new way of viewing the processes controlled by the melanocortin system. We suspect that defensins will turn out to have a role in all aspects of melanocortin signalling, not just coat color," Millhauser said. The discovery of a new participant in this pathway opens up additional areas for drug research, said the article's co-first author, Sophie Candille, a former graduate student in Barsh's lab. 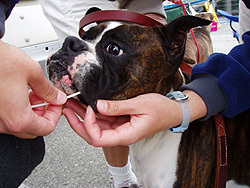 Candille visited five Bay Area dog shows over six months to gather hundreds of samples by gently swabbing the inside of the dogs' cheeks with a brush. The project began a few years ago with boxers and Great Danes of different colors. Candille identified a region of the genome that differed between them. Then she moved on to 36 other breeds, ranging from Large Munsterlanders to miniature schnauzers. "Looking within one breed rapidly identifies the general region, but looking at different breeds allows you to home in on the gene that's responsible," Barsh said. Candille's work narrowed the genome region to a gene that makes a beta-defensin protein. One version of the beta-defensin gene produces yellow dogs, a mutant version of the gene produces black. Co-first author Chris Kaelin went on to prove it. When he inserted the dog gene in transgenic mice, their fur grew out black. But the finding's relevance extends far beyond fur color. The beta-defensin gene is a member of the unusually large and variable defensin family of genes. A human can have between 40 and 50 different defensin genes; dogs can have up to 46. Though researchers had assumed the defensin proteins were microbe fighters, Barsh isn't so sure. "We really have very little evidence that defensins do much in terms of defending," he said. "The genetic approach is more agnostic, and suggests that defensins have additional or alternative functions outside the immune system." Barsh and Millhauser's immediate plans are to learn more about what human defensins do. A longer-term application is to discover whether defensins will serve as templates for drugs. Other collaborators in the study were former Stanford graduate student Julie Kerns, who verified that typical mammalian coat color genetics were not operative in dogs; mouse geneticist Bruce Cattanach, who also breeds boxers and helped recruit many samples; and Sheila Schmutz, a dog geneticist at the University of Saskatchewan and a Large Munsterlander breeder. Note to reporters: You may contact Millhauser at (831) 459-2176 or glennm@chemistry.ucsc.edu.